I'm a fan of Naoki Urasawa's work, more specifically Monster and 20th Century Boys which are also two of his better known works. The multi-layered storytelling and depth to his characters are what really impressed me about him as a comic artist and writer. 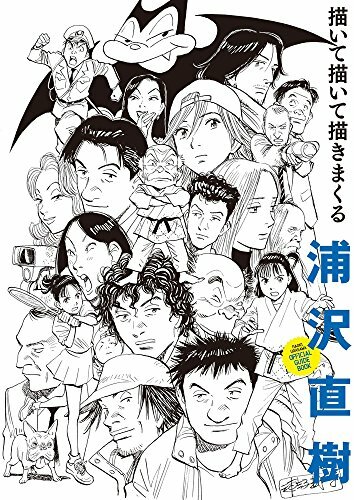 浦沢直樹 描いて描いて描きまくる is the Naoki Urasawa Official Guide Book. This 272-page paperback is more of a biography than an artbook. The artworks are included to go along with the text, which are all in Japanese. So if you're looking for an artbook, you might be disappointed. However, if you know Japanese, I believe you'll be deeply rewarded by intensive coverage of Urasawa's work over the years. The titles talked about in the book are Pineapple Army, Yawara!, Master Keaton, Happy!, Monster, 20th Century Boys, Pluto and Billy Bat. Unfortunately I do not understand Japanese so I can't really enjoy this book as much as I want to even though the manga art is nice.